Occasionally, you may find that clicking Load Content fails when trying to add content to the whiteboard. This can be as a result of PowerPoint already being open, in which case you’ll be prompted to close it and click Load Content again. In more rare occasions, loading content will fail without any hint as to why. If this is the case, you can still load the content into the Whiteboard by exporting your presentation as a series of images, and loading those into the Whiteboard instead. Follow the instructions, below, to load the images into PowerPoint. Click All Slides. This will save your images into the directory you specified. 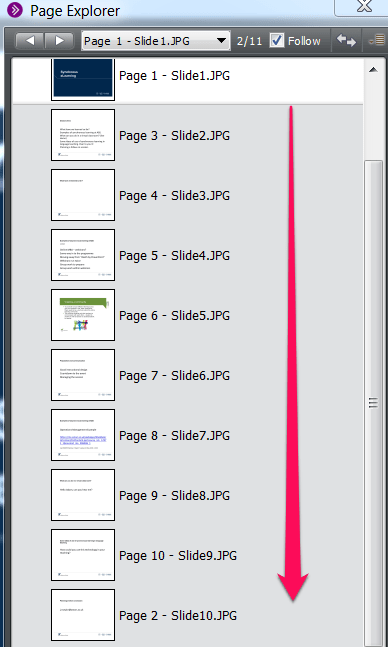 If you have more than ten slides, and are using Windows, watch out for the order of the slides you import. 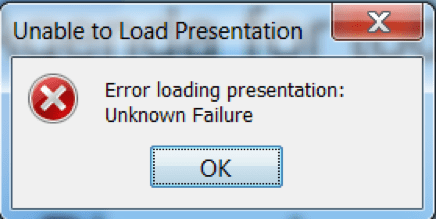 PowerPoint for Windows exports the files in a way which will result in an incorrect order when you load them into Collaborate. Instead of slide one, two, three etc, you will end up with slide one, 10, 11, two, three, four etc. You can prevent this from happening by loading the slides in batches of no more than 10 (eg slides one to nine first, then 10 to 19, 20 to 29, etc etc), or load them all in one go and rearrange them afterwards. Click Load Content and browse to the folder where you have your images. Select no more than ten if you are avoiding the problem with ordering. Click Load and Import Images as Individual Pages. The Page explore then opens, showing you the slides you’ve imported. If you’re going to import another batch of slides, the system will slot them between slides 1 and 2, which is not very helpful. You want slides 10-19 slotting in after your last imported slide, so double click on it in the Page Explorer to navigate to it, then load your next batch of slides, and so on. In the Page Explorer, click and drag Page 2 which contains slide 10 down to the bottom of the list and you have your proper sequence back.